Here are a few live websites powered by iScripts Easysnaps. This information is submitted by our clients. Your wish to create Albums and image folders that hold your memories can be done with a model like yourwebimages. This is a powerful image hosting site that will help you in hosting your images besides providing a large number of utilities. Various image editing options make the script more useful for its users. 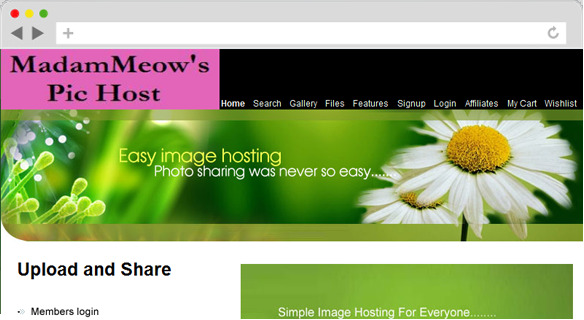 Host and share your images as you wish! madammeowpics.com is a powerful image hosting website allowing you to upload as many photos as you wish and organize and categorize them into albums. Easily create new albums or use existing ones making it a great platform with options to create a picture on the web and link it to friends. The base script iScripts EasySnaps has been customized to make the upload process as simple as possible by just browsing an image from your desktop and to resize the image before uploading.